With such a large amount of tomato varieties to choose from, selecting the best choices for your garden can be a daunting challenge. You can select from many different colors: pink, red, yellow, orange, purple/black, blue, bi-colored, and other colors like white, green, and even brown. Are you growing in containers or in the garden, or both? And how many containers, and how large is your garden that offers space for how many tomato plants? 1. Growth Style: Size and productivity of the plant. What plant growth style suits your needs. Determinate varieties are short, generally 2-3 feet. All the fruit matures at the same time. These varieties are best for container planting and cooler/coastal areas, or even desert areas, or high altitude regions, where adverse weather conditions invite you to harvest your tomatoes in a shorter period of time before oncoming and less desirable cold or heat may be upon you. Indeterminate varieties usually provide you the most fruit. These plants will continue to grow, flower and provide fruit throughout the season until frost. Most of your largest fruiting varieties and most of the tomato varieties available are indeterminate. Unlike the determinate varieties, the indeterminate varieties will need support with by staking or caging your plants. These varieties are best suited if you have a longer growing season to produce larger plants with larger-sized fruit. Mid-Season varieties (70-84 days) may be most suitable if you are in a region that gets too hot toward the end of summer when hotter conditions encourage flower drop and discourage fruit set. Late-Season varieties (85 days or more) where you have ideal warm conditions with sufficient sun that will allow for growing larger plants and harvesting larger fruit until frost. 3. Purpose of Harvest: Will you be growing tomatoes for snacking and salads (which may require some cherry or smaller fruited varieties), for canning or salads (which may require smaller - medium sized fruits, making sauces (which may beg for meatier paste tomatoes, or bigger-fruited varieties for sandwiches, salads or other favorite culinary delights. I suggest including within your total plant count: a selection of different colored cherry varieties, different shapes and colors of medium to larger-sized varieties, and at least one paste tomato variety. This will assure you of having a harvest of distinctive flavors along with a beautiful display of colors and shapes to entertain your family and friends. 4. Open-pollinated, Heirloom tomatoes or Hybrid: There are three different kinds of tomato varieties: Open pollinated/non-heirloom, open-pollinated heirloom and hybrid. Open-pollinated varieties (also referred to as non-hybrids) are produced from the seeds of the same variety year after year. The seeds saved from the fruit of an open-pollinated variety will produce identical fruit to the parent. Each of the thousands of open-pollinated varieties may be sustained, unchanged, for hundreds of years. Heirloom tomatoes (aka heritage tomatoes) often have valued characteristics (taste/texture/family history). All heirloom tomatoes are open-pollinated but not all open-pollinated are heirloom tomatoes. In the world of heirloom tomatoes there are basically two categories, commercial heirlooms and family heirlooms. Commercial heirlooms are varieties developed or sold by commercial seed companies for the marketplace prior to the 1940s. 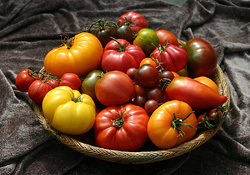 Family heirlooms are tomato varieties whose seeds have been passed down through a family for generations. Hybrid tomatoes are produced by cross-breeding a male flower of one pure and distinct variety with a female of another pure and distinct variety. This can produce a plant that exhibits the best qualities of both parents and expresses more favorable characteristics of either parent. The most admirable characteristics of hybrids are: they are often created to resist specific diseases, they are often bred for having thicker skins to withstand the rigors of shipping and longer shelf-life, they are often bred for producing a more abundant and concentrated fruit production. Hybrid varieties may lack the abundance of flavors offered in open-pollinated and heirloom varieties. And hybrids do not offer you the option of seed-saving since seeds from these fruits will not produce the same fruit as their parents.